A solid red Canna growing in our flower bed. Canna is the only member of the Cannacea family. The word Canna comes from the Celtic word for cane or reed. I saw this barn just North of Cold Mountain (yes, That Cold Mountain). I liked the way the artist made it look like the horses were looking out of a window. 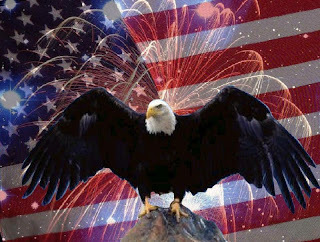 HAPPY INDEPENDENCE DAY ! ! A lady on a radio talk show brought up a good point the other day. She said we in America, should not be saying "Happy 4th of July". Instead, we should say "Happy Independence Day". She made her point this way. We don't say "Merry December 25th", or "Happy January 1st". I am guilty as I am sure almost everyone else is. So this year I am going to do it correctly. Snapped this one at Smokemont information center at the entrance of the Great Smoky Mountains National Park. My wife Sharon and I took a much needed vacation a couple of weeks ago. Thursday May 15th, we headed West on I-40 bound for Asheville, NC. We spent the night in Asheville, and toured Biltmore House Friday. That is one Gimongous house. and well worth the visit. I hope to go back sometime during Christmas. The "Festival Of Flowers" was going on while we were there. I got some photos of the flowers, but I need to work on those before I post them. I never claimed to be a great photographer just someone who likes to take pictures. That afternoon, we made our way to the wonderfully small town of Waynesville, NC, where we stayed at the Windover Inn Bed & Breakfast Friday and Saturday night. (There was a Gingerbread couple on the pillows YUM!) The place was all we hoped it would be. A restored three story home (circa 1883) furnished with period furniture (if you don't count the hot tub--which by the way was wonderful after hiking in the Smoky Mountains). 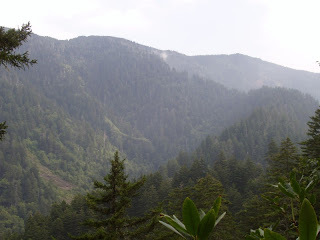 We did go up into the Smokies on Saturday, and visited Clingman's dome. Fifteen years ago when we were there last, the 1/2 mile trail to the observation tower seemed much easier. I wonder why that is? There are five benches about one hundred yards apart on the trail to the top. We hit all five, and a couple of large rocks before we made it there. I have to say however, I saw some considerably younger people huffing and puffing as well. To get to the Great Smoky Mountains National Park, we had to go through the Cherokee Indian Reservation. When I was a kid and had my picture taken with an "Indian Chief", I don't remember him wearing cool shades like those I saw being sported by some of the befeathered "Chiefs" this time. We wound up our too short stay Sunday morning, by taking a side trip just seven miles outside Waynesville to as close as we could get to the base of Cold Mountain. Yes, the one the book and Movie are named for(see photo). All in all I highly recommend this part of North Carolina if you get the chance to visit. Just bring some comortable shoes, and a light jacket or sweater, even in the summer. Believe me, you will be glad you did in the higher elevations. I was browsing the net and found a pretty neat site. 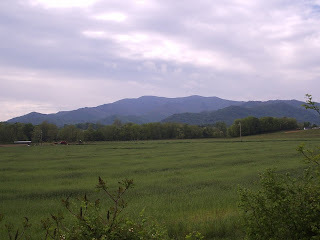 www.gosmokies.ning.com. Here, you can read Smoky Mtn. vacation stories, view photos, etc. 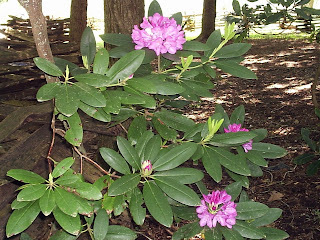 If you like the Great Smoky Mountains National Park, then you will enjoy this site. Lately, my posting seems to be weather related. The last one celebrated a much needed rain. This one however celebrates the fact that a tornado did not hit my house. I will admit it passed six miles away, but that is about one hundred miles to close for me. The photo shows the gathering storm clouds Saturday. What I thought was going to be an ordinary thunderstorm, turned out to be one on steroids. About three PM, Sharon called me from across town (visiting with a friend just out of the hospital) and asked if I had heard about the tornado. What tornado? I turned on the tube and there it was indicated on the radar very close by. Then there were reports that it was on the ground. Time to head for that room without windows I thought. I looked out the bedroom window and saw what looked like smoke. It was in reality, a wall of very hard rain, moving very fast. It reminded me of a wave on the ocean. As it turned out this was a wimpy one as tornadoes go. It was over very quickly and was an F-0 with 75 mph winds. It was enough however, to rip the top from a mobile home, roll another over and into a third, and uproot some gimongous trees. Fortunately no one was hurt. A second tornado (also small thank goodness) touched down about twenty miles to the north a few minutes later. Minor damage there and also no one injured. I tried to find someone with pictures of the funnel cloud, but could not. It was said to be about one hundred yards wide. Again, small as tornadoes go, but big enough for me.